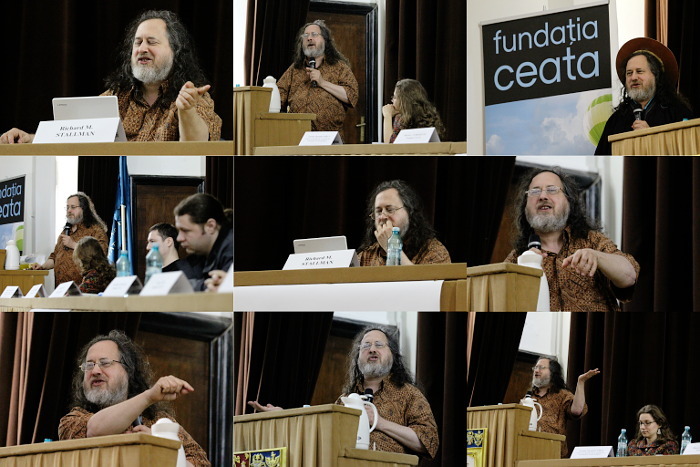 I wrote a few words last week when Richard Stallman visited Romania and delivered a talk, then he was invited at the official launch of a local organization, Ceata Foundation (it is actually older, but until now it was an informal group which recently was registered officially), which is crafted very much upon RMS style: Free Software supporters but to the extreme, burning bridges with other local groups (for example harassing fedoraproject.ro contributors). Time for a disclaimer: I worked for a couple of years with Ceata on various projects and even had some formal position inside, but left in the summer of 2011 entirely for personal reasons, it was NOT due to differences in our views on FOSS or leadership (which were plenty), I could easily handle that part. It was my private life. So yes, I have inside knowledge and could be suspected to hold a grudge, put I promise is not the case. So, back to the point, Ceata managed a very powerful image move by bringing the most important guest for their core audience. And they scored a second image move: to get RMS to do an interview at a local TV channel, Nasul TV. It is a very small TV channel (I don't have them on cable, only few cable companies carry them) but is still a TV channel. Ceata put a set of requirements, which were accepted. The interview was broadcasted and is almost one hour long. Do not have any bias, just watch the interview, after a very short introduction in Romanian, it is English with Romanian subtitles. I admit of watching only about 5 minutes, I know well the topic and I am just after attending in person one RMS talk, but for those who didn't, there is a lot of insight. So far everything was positive, let's move to the "shoot in the foot" part: after the interview, Ceata is unhappy. They have a problem with the video format, they requested the WebM format to be used exclusively, but it was MP4 inside a Flash player. After talks, a link to the WebM version was added. Also there is an issue with Facebook page for the show being mentioned near the end of the interview, Ceata requested that part to be cut to no success. Then they have issues with the translation, things like the Romanian words used to translate "proprietary" or "non-free". And the big issue is with the license, the video recording was released as CC-BY-NC-ND, while the television does not understand the issue with NC (and imagine someone will sell their work for a profit), Ceata has a problem with the ND part: they can't replace the translation and can't censor the Facebook part (note: RMS himself uses CC-BY-ND). So what a Free Software activism is expected to do? You can see it on their mailing list (in Romanian language): they are unhappy, threaten the TV channel, invite members to comment on the website, talk about a flashmob, boycott, even the "DDOS" word was heard (that mail is still up). Currently the flashmob is under planning, supposed to happen tomorrow morning (details in the linked thread). Focus was lost, it moved from the license to linguistics. 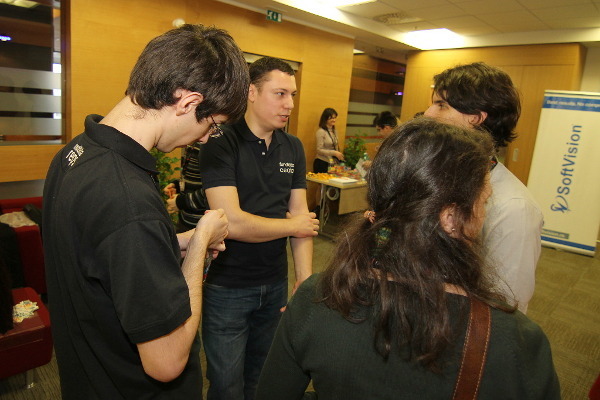 Next time with another such FOSS speaker will be around, expect him to be seen on TV. Or maybe not. I hear he was here last time in the mid-90ies, but that happened ages ago and very few people know it ever happened, so when Richard Stallman came to Bucharest it was quite an event for the local FOSS community, many traveled long distance to see him talking. For me it was obvious to go there, I never attended one of his talks and it was a perfect opportunity to take some photos. I have to acknowledge my reaction wit the talk was "not impressed", indeed he is a good and experienced speaker, but maybe 2/3 of his speech I could have delivered myself (albeit in a not very good English, I can talk hours about the benefits of Free Software, its history, problems with SaaS) and the rest would not, because I find myself in disagreement with (he has the known "GNU/Everything" antics, he thinks Free Software activists are more important than developers and such). Really, there is nothing new, the biggest part of the audience already knew it any many could talk about it, the discourse is classic (and old, including the ancient Bush joke) with few minor updates (like the Obama mention). You see one, all are the same, to the Saint Ignucius part to the final auction. From a photographer point of view, I have more reasons to be unhappy. Is not that I had to take care not to shoot them while picking his teeth and nose or yawning in front of the full audience, is he not being consistent with himself. RMS asked the audience a few things, for example not to geotag his photos (this one is stupid, since the place of the event is well known) or publish the videos in open formats (I understand that), but the worst is he asked people not to post photos of him on Facebook, because it is a "massive surveillance machine". While I agree in many ways with his views on Facebook, is still stupid and useless: say I post the pictures on Google Plus (he wasn't against that) and under a Free license (because I believe in that), then anyone can take my photos and put them on Facebook, with face tags, geolocation and everything. Forbidding that would make them non-free. Second, when talking about proprietary software, RMS told us about a dilemma: you have two evil options, break the license or not share with your friends, and recommended the lesser evil, sharing. Sharing to Facebook is also the lesser evil, since it won't let your friends down. Third, if people go to a platform like Facebook for news, not offering them the news will leave them uninformed. Is better to have people informed, even if from the wrong channel. Last, from a legal point of view, it was a public person at a public event. That is news, you can't restrict it. 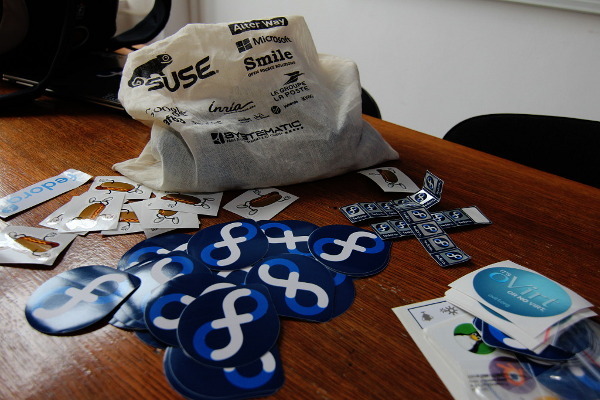 As promised in yesterday's post, is the time to come back with photos from the Fedora 18 release event that happened today in Bucharest. Being here for the OSOM conference, Christos Bacharakis, Fedora Ambassador from Greece, with help from ROSEdu and OSOM, organized this event. Myself, I was pretty much a simple attendant. I have to witness, the participation exceeded my expectation, it peaked at 15 people (including us and the organizers). 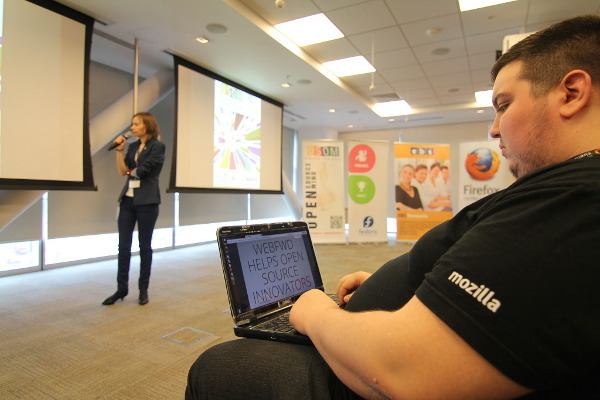 However, I couldn't abstain myself and asked the audience who is using Fedora: only two hands raised. I think Chris convinced at least a couple more to give it a try. Since we pretty much knew each other from before, the talk was very open and the event interactive. 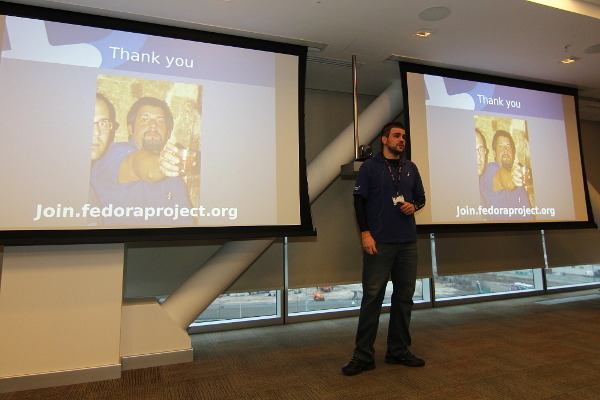 Chris started with a general presentation on Fedora, the project, goals, governance, joining and such. 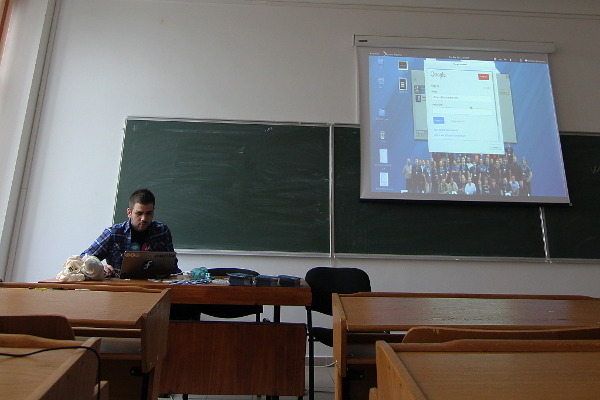 With the hackfest, we weren't that lucky: the Raspberry install refused to cooperate, with nobody in the room having access rights to the Romanian section in Transifex we couldn't do translations, but we talked about those topics, explored wikis and websites. Myself, I tried to keep the audience busy a little with some talk about doing graphics while the Raspberry PI image was downloading (the internet connection was spotty). There was some swag (install DVDs, stickers, pins, buttons) for the audience, but also some extra. So I grabbed the leftovers, a few F18 multi-desktop install DVDs, ready to be given away (also some went to ROSEdu for their students and some to the guys in Cluj). Those who resisted until the end, we went for some food in a nearby mall afterwards (not pictured). 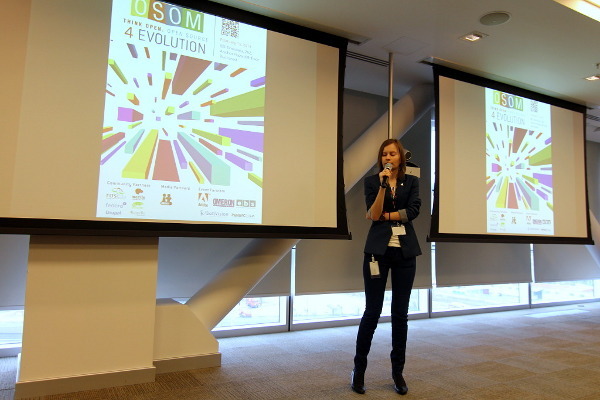 This is a short walkthrough in images of the OSOM conference as I saw it today happening in Bucharest. 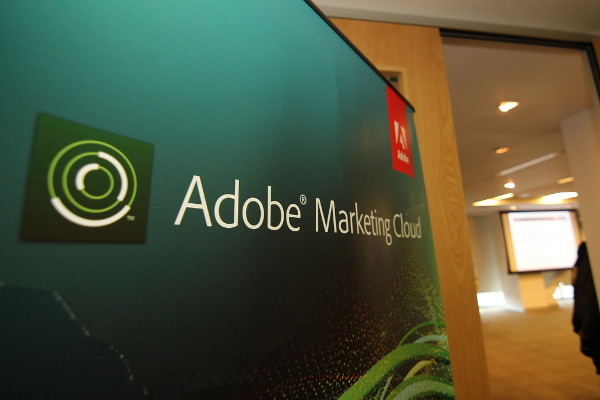 It pretty much went as expected But I still not understand why the Adobe offices were a right place for a FOSS conference, Maybe it was their wonderful proprietary reader running on a proprietary OS used to display many of the sides, or maybe it was the free sodas. Anyway, a solid presence from Mozilla and ROSEdu, but also tracks from Drupal and openSUSE And, of course Chris from Fedora, kind of a rockstar, who made the conference turn from Romanian to English language (no problem, our communities are quite fluent with English) During the presentation he made an important point the invitation to tomorrow's Fedora release event which also happens in Bucharest. Beside the presentations, the most important part was the opportunity to meet again old friends from various local communities. 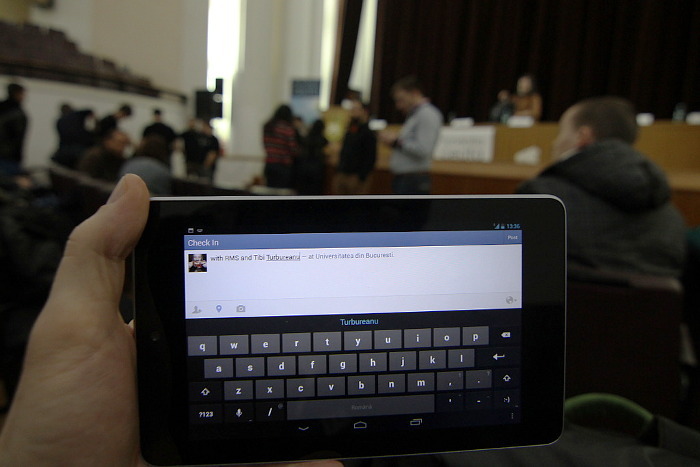 Stay tuned, a similar report will come in the next couple of days from the Fedora event. I told I will come back with more info about a Fedora 18 release event expected to take place in Bucharest, I still have not much to say about it, but I see Chris already have a post with the content and schedule (and his blog is not correctly aggregated on planet) It will take place on Saturday at 12:00 at Facultatea de Automatica si Calculatoare (Politehnica University of Bucharest), room number EC102, see more on Chris' blog. 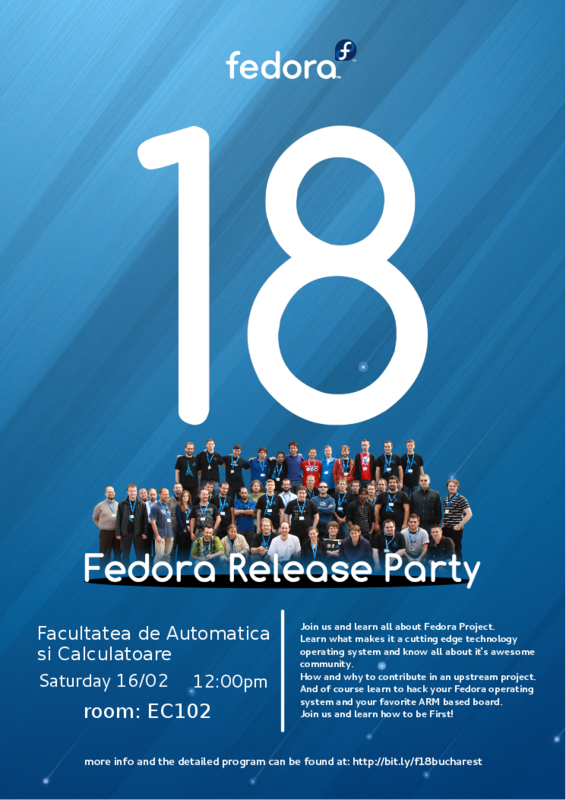 Note: this is going to be the first Fedora release event in Bucharest in the last couple of years (since Fedora defaulted to GNOME Shell and the local team considered is nothing worth celebrating about that). Open Source Open Mind or OSOM in short is the name of a yearly event "designed to reveal the general Open Source and Free Software concepts" (quote from its about page now at the fourth edition. It looks like so far it was very small and held at a couple of universities across the country. Honestly, I never heard about it. So when an invitation came to the official address, it got unnoticed. Later, when one of the organizers contacted me personally, I gave it a second look and didn't like what I saw: the event is hosted at the Adobe Systems offices in Bucharest, by any means far from the ideal place for a FOSS event and as it conflicted with my day job, my reply was not a commitment "I may attend, but can't make a promise now". In the meantime, they contacted a proper Fedora Ambassador, Chris from Greece. He got in touch with me, I expressed my doubts and reiterated the availability part: can't make a firm promise. And even if I go, I do not intend to keep a talk (sorry, but I can't give with a straight face promotional talks about software I find not functional in its default state). 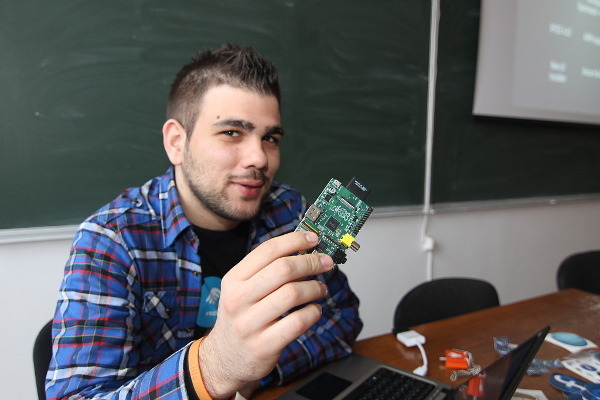 So he pursued the action inside Fedora and is attending the Romanian event with a talk, first time after 2009 when an international Fedora speaker visits the country. Now I have a lot more free time and I understand quite a few ROSEdu people will be there too, so there is potential for quality time and good side-talks. I will attend (but only in the audience, not as a speaker) and report afterwards. Being here, Chris wants to organize also a Fedora release event too, most likely held at the Politehnica University of Bucharest, but more info about that at a later time, when the details are set. After my employer crashed following a story worthy of Hollywood movies (complete with operations signed by 3-letter American agencies) I see myself finally on the jobs market and open to freelancing stuff. Considering the local market for graphic design using FOSS tools or for open community things, freelancing may be a long term option. Or embracing the "dark side" may be a more practical approach. We'll see. The net result is for the foreseeable future I should have more time to take care of the blog and participate to local FOSS events (one of those will take place soon, I will write about it in a few days when there are thing ready to announce). So when freelancing the first step is to get an office at home ready for work. In my case, getting the household laptop usable: it was used with Windows 7 for trivial tasks: web surfing, multimedia play and very light photo editing. I left from the start some unpartitioned space to put a Linux "later, when will get enough free time" (and an unspoken "when a decent Fedora release comes out" - my desktop at work was still F14). I can't use a Windows system for real work, so a Fedora install was in order. Since, aside the horrible new Anaconda UI, the experience of installing Fedora 18 Beta on my netbook was smooth enough, I expected the same on the laptop (a "N" series Dell, one of those sold with FreeDOS). But wrong I was. It was the hardest Fedora install ever, I may exaggerate a bit, but it felt worse than Red Hat Linux 4.2 (my first Fedora/RHEL/RHL) install. 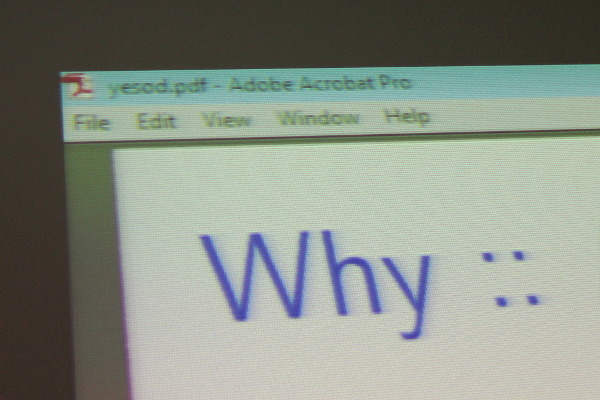 The first problem was creating the LiveUSB: the Fedora tool refused to play nice and I didn't feel like going the dd way on Windows, so Unetbootin did the trick again. I didn't count, but I believe I had to restart the installer over a dozen of times because it crashed in various places (most often when configuring the storage or right after it - and don't imagine I tried complex stuff, just "simple partition" as ext4). Finally, I managed a workaround for the storage part (create all the partitions as LVM and then change their type to "simple") and had a "lucky" run with no crashes elsewhere and the install finished. Had to disable ACPI so the computer won't lock-up at boot, but that's pretty much a rule when running Linux. Now the computer is up and running with a shiny MATE desktop, configured to look and act pretty much as my old and trusted Fedora 14. I was able to take a first (unpaid) task today.